After a long family association with the Gambia, through his aunt and my father, my husband Dominic & I stumbled across and instantly fell in love with, Hibiscus House! On paper and in reality, this little hotel encompasses 1000% of our wish list for the future, a challenge, a fun business proposal, great staff, past happy clients, future ones to delight and even those that fall between these two classifications! To wake up every day and have to put the phone down because the birds are chattering too noisily is, in my opinion, a high-class problem to have! Dominic is 59 and I am 53 (young huh?!) – and so not ready for retirement! This industry is completely new to us, however we have good business heads and are very much people people (if you know what I mean!) and we have a truly professional, warm and service-orientated staff. We certainly feel that we are up for a good challenge of turning this already well loved and beautifully designed and unique hotel into something even more special. Many of the Staff have been at the hotel for over 10 years and nearly all the others for over 5 years. They all know what they are doing and get on with each other like a family (this sounds corny but is true!). They have a love for many of past guests. I have been the advance party whilst Dominic deals with work in London and I feel safe, respected and part-of something quite special. The hotel has, since conception, attracted people with a preference of a path slightly less trodden than the busy ‘Strip’. 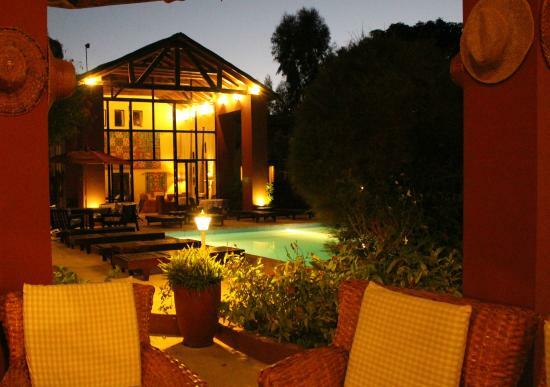 It is situated within a genuine African Village, surrounded by a very proud, welcoming and hospitable community. Recently, I have been lucky enough to meet two of the prominent Head Masters of the local schools and the Alkali Himself (Chief) we are hoping many of our guests will also enjoy sampling and visiting the local community. Those that have stayed at Hibiscus over the past 10 years will, we hope, still visit us and be very welcomed. The staff are, for the most part, unchanged and very much appreciated by us. Some much-needed renovations are taking place – but I hope that you will find that these are tastefully done and add rather than detract from the charm of the hotel. Some examples of these – new generator, new WIFI, air-con, Sat TV for all rooms; new roofs, refurbishment of bedrooms, and the heating of both pools for the windy Jan/Feb period and a fab masseuse! To those that have not sampled the exquisiteness of this little hotel yet, you have a treat in store! We will continue to welcome people to the restaurant for Lunch and Dinner - our Head Chef Saidou is naturally talented and he runs an efficient and delicious kitchen! We are not planning on closing the hotel during the year, so please help us by looking out for ridiculously good offers for the ‘Green’ Season – July, August and September, along with the possibility of doing a full hotel rental, (with staff) for weeks with family & friends. Hibiscus Suite is set over 2 stories with a large private walled garden.